OK, Duck fans, let’s be real here, let’s think big. It’s the morning of Dec. 25. You are about to tiptoe to the Christmas tree stationed in the living room. You are about to start snipping the ribbons, ripping the paper, popping the boxes. You are about to uncover socks, jackets, sweaters, ski boots, iTunes cards, Kindle tablets and HDTVs. And on and on. And on. But deep down, Duck fans, what are you really hoping is under that tree? What have you been secretly wishing for the past few weeks? I hear the chorus: A Rose Bowl win over Wisconsin! Makes sense. Overdue. Nice! But is that really all you want, Oregon? Not to sound selfish, but shouldn’t you consider a victory in Pasadena sort of a mid-sized gift? Shouldn’t you be itching for a bit more, actually a lot more? 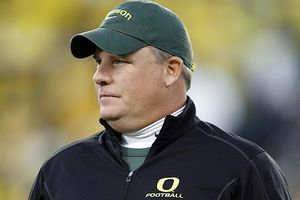 Say a guarantee that coach Chip Kelly sticks around for a lot longer in Eugene? Nothing is forever. But if you’re thinking of the future, you gotta hope that the Gift of Chip Kelly For At Least Another Four Years (the length of his existing contract) is hiding under the branches of that tree. And since everyone has been extra good this year — keeping Autzen Stadium packed, buying the latest gear — hope, too, that Santa Claus tacks on a few more years to that total. I only bring this up because ’tis the season for coaching maneuvers, and the incessant Kelly-is-going-somewhere rumors have entered new territory this December. A season ago, the talk was Kelly to the University of Michigan, or to the University of Florida. Now, it’s not only Kelly to Penn State, but Kelly to the Miami Dolphins, Kelly to the San Diego Chargers. Next season at this time, it’ll be even louder. This is what happens when you coach a team to three consecutive BCS bowl games and three consecutive Pac-12/Pac-10 titles (and a 33-6 overall record) in your first three seasons as a head coach. There is no evidence any of the talk has legs. But you never know. Kelly has never publicly stated he loves the UO job so much and the quality of life in Eugene so much he hopes to remain for years and years. Indeed, his views on how content he is at Oregon remain a mystery. Common sense tells us that Kelly must ponder from time to time what he could accomplish in the college ranks if he was in a recruit-rich part of the country, say the Deep South or the Midwest. It would surprise no one if he has dreamt of the NFL as well. Crazy speculation? Most likely. Still, think back to a year ago. Who would have imagined then that Urban Meyer would be the coach at Ohio State now and not Jim Tressel. This much is clear: Whether he ends up in another location, takes a break from coaching, or perhaps slides into retirement, some day Chip Kelly will no longer be wearing the green, yellow and black on the sidelines at Autzen. It’s inevitable. The question is when. Kelly has four years left on the six-year, $20.5-million contract he signed in September 2010. The buyout portion is $3.75 million this season, is $3.5 million next season, then drops to $2.5 million in the fourth and fifth years of the deal. An NFL team or a cash-rich college power won’t find those numbers much of a deterrent in their pursuit of him. For Oregon, the stakes are high. If Kelly serves out the length of his existing contract, a Pac-12 title and a national championship appearance will be a possibility each and every season. The sport of college football will continue to be revolutionized in Eugene, Ore., before the Autzen eyes. Expansion of the stadium will creep closer. Other UO teams will benefit. There will be even greater appreciation of Casanova, Brooks and Bellotti as cornerstones of a stable, thriving, innovative program. College GameDay will keep coming back and back. Put it all together, and the Ducks will slide into the unquestioned role of bona fide national power. So how do you keep Kelly around? He reportedly isn’t motivated by the desire to become super-rich. But sometimes being told you are really wanted, really needed, counts a whole bunch. Sometimes that takes the form of a contract extension and, yes, more money. Sometimes that means a shared vision. Kelly is about excellence. Will Oregon keep heading in that direction, athletically and academically? What if the next president at the University of Oregon isn’t, well, much of a sports guy and does not see value in keeping the football program a national contender and at the top of the Pac-12? Other factors you can’t control. Is Kelly comfortable in his adopted hometown? Does it fit him? Is it growing on him as it has so many others in the past? Does he find trying to alter pro football a worthy challenge? College football-wise, a win over the Big 10 Badgers on Jan. 2 will give another solid boost to a Duck program that has grown immeasurably over the past quarter-century. Oregon may not be a “traditional” national power today, in the way Alabama or Penn State are thought of, but any critic who tells you the Ducks are not a Top 10 program is suffering through a flashback from the 1950s or 1960s. But come on, Ducks, don’t stop with a Rose Bowl win. Unwrap the presents under that Christmas tree with a more important wish in mind. Knowing that nothing is forever. Wish for the Gift of Chip Kelly For At Least Another Four Years.